Do you ever wonder about some of the most popular beliefs in China? 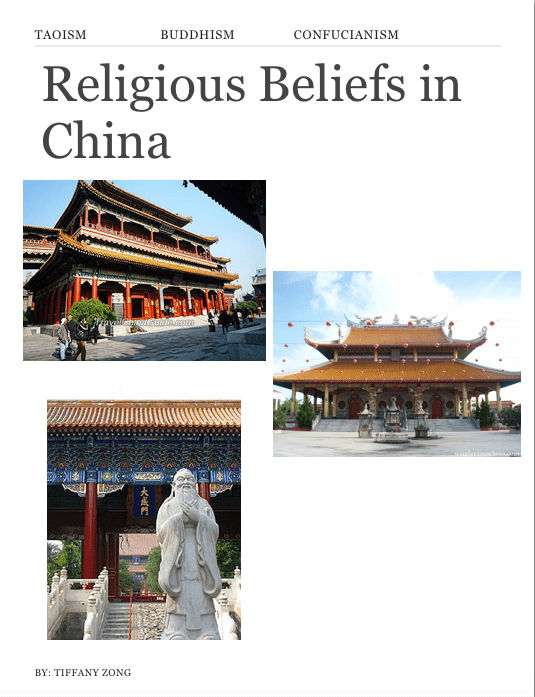 If you do, then continue reading to find out about Taoism, Buddhism, and Confucianism and what each of these religion means for people in China and around the world! The purpose of this One Day is to sew and create something for the kids that aren’t as privileged as us and need warmth for the winter. So I wanted to create a fluffy kind of blanket or a small and soft charm. Since they are the children that are in need of adoption, it is important that they have and feel love. So if I created a soft heart shaped charm it could make them feel warmer mentally. One of the biggest challenge I feel is getting our made items to the children on the day of one day and still being able to finish them. I’ve seen YouTube videos on how to knit little charms, so the video can guide me into creating them. This catchall addresses my client by providing them a space where they can place all there nesscary school materials. It’s easy to access and looks organized to! The biggest success was getting the diy chalkboard paint to work, and trying to find the ingredients. My goal is to make my writing more interesting and more descrpictive. My goal is to improve on the responsibility part. I want to manage my time better by sitting away from people that distract me and also my friends. For example, it took me little longer to finish my poster at the beginning of the year because my friend and I got off task frequently. I can improve with this by telling the people that sit next to me to not talk to me and also focus on my work more. This goal takes place on the exemplary column of the responsibility section. My second goal would be to help and motivate other students. I can encourage them to solve harder problems and help them to the best of my ability if I understood the question. I can improve in this by seeing whenever someone is struggling at my table to help them when I can. This one takes place on the expemplary column in collaboration. I wrote about how Spartans lives were like. Men and women had differences when they lived in Sparta. Men had to go to harsh training, while women state back and guarded villages. As an ancient Chinese family, we had to pray daily. One day things changed for Lin and her brother, Yan. They were swirled into the lake and was lead to another world. They soon found themselves in the strange world and were unable to leave until their mission was complete. Sabrina a 10 year old orphan, and Daphne a 5 year old girl are now orphans. They got home from school one day and found out that there parents weren’t home. For them that wasn’t a surprise because they had work. But by midnight they still wasn’t there so they called the cops. They got put into foster homes, and every time they escaped. So at last they got put with a women who claimed that she was their grandmother. Daphne believed her but Sabrina didn’t at first. The very next day, Granny Relda and her assistant Mr. Canis said they were detectives and there was a crime so they went there and saw a giant right there. Granny and Canis got carried of by it. They had the the prince charming did it but he was trying to help. At last the found out that Jack was doing it because he was losing his fame so he wanted a giant to attack then kill the giant so that he would get his fame back. while that was happening Jack also wanted to kill the sisters. character: granny Relda is really caring and loves to help. She loves solving crimes and seeing everafters change. She also makes really weird colored food, like green meatballs, purple carrots and lots more. Connection this book is like the land of stories because they both start off with orphans and the kids both are detectives. Question: Why could only Tolly and Mrs. Oldknowe see Toby, Linnet, and Alexander? I think only they could see them because people that believe them can see them. Or maybe because they were the only ones in the actual family and if you are not in the family then you can’t see them because it could be like a family thing and if you don’t believe it then you cant see it. Also because it may be a type of blood thing so if you don’t have the special type of blood then you can’t see it, but most likely their ancestors gave the blood or something else and made them able to see them. © 2019 tiffy | theme by tony modified by mr. kupy | Ituloy Angsulong!.